A French Bulldog is missing and possibly stolen from his owner’s property in the Bolton – Caledon area of SW Ontario, Canada. Poutine is a brindle pied (black and white) neutered male French Bulldog. He is wearing a blue collar, and is microchipped and wearing pet tags from Nobleton Veterinary . 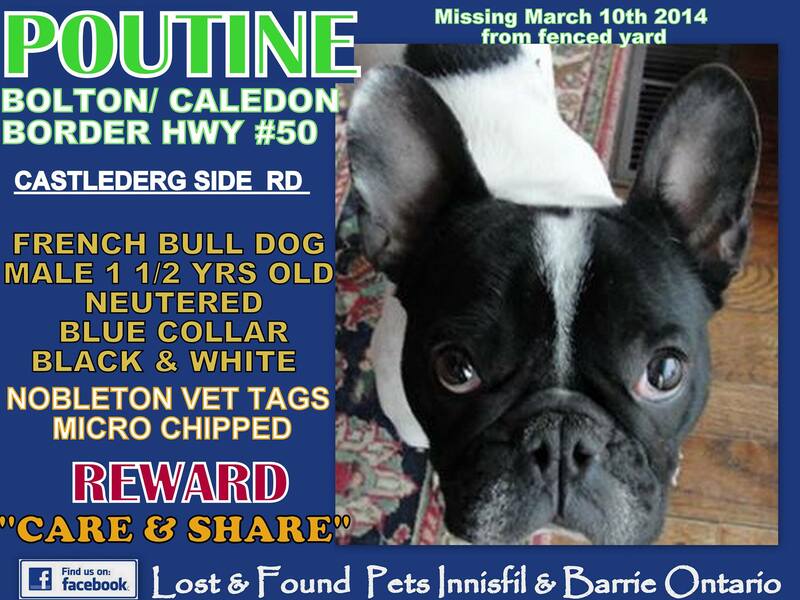 Poutine went missing from the fenced yard of his home on Castlederg Sideroad, which is near Highway 50 on the border of Caledon and Bolton. THERE IS A NO QUESTIONS ASKED REWARD FOR HIS RETURN! Poutine was bred by our friend Richard Rockford, of Aristocrafts French Bulldogs. He is a son of Richard’s lovely French Bulldog boy, Baxter, who tragically died last year due to veterinary error. As you imagine, Richard and Ewa, along with Poutine’s owner, are devastated. Please share – let’s bring Poutine home!